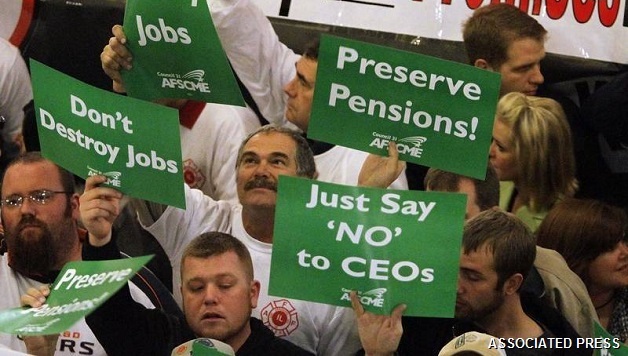 ASSOCIATED PRESSThe pension crisis that resulted in protests such as this in Springfield by teachers and government workers is just one of the issues affecting the public's lack of faith in Illinois government. A history of corruption, a dismal climate for work and business, and political bickering are all reasons Illinoisans give for wanting to live elsewhere. Workers in Illinois are confronted with a concerted effort by the political establishment to destroy workers’ rights and standards of living, beginning with the $100 billion “pension crisis” that was created through decades of bipartisan agreements not to fund public pension systems. Now, the Republican Governor Bruce Rauner is making his “Turnaround Agenda” a precondition to signing any state budget sent to him by the Democratic legislature. This agenda includes an end to prevailing-wage agreements and the gutting of workers’ comp, unemployment benefits, and liability lawsuits. Rauner has also tried to create local “right-to-work” zones, but this initiative was brought down by union-led protests in every area where hearings were held. Instead of building from that success, the response of the union leaders has been to assemble the latest in a long line of weak, top-down coalitions of public sector unions and nonprofits aimed at lobbying the same politicians that have consistently voted to gut pensions and maintain corporate tax avoidance. By his approach to bargaining new contracts, Rauner, who promised during his election campaign that he was ready to shut down the state government if he didn’t get his way, appears to be trying to force the unions into all-out confrontation, setting up the possibility of a strike or lockout. Evidently doubting its ability to run a successful strike, the major public sector union, AFSCME, successfully lobbied the state legislature to take away the right of state employees to strike, and the governor’s right to lock them out, from now until July 1, 2019. This was done without consultation with other unions, despite the very dangerous precedent it sets. In the meantime, the state budget crisis threatens mass layoffs in private agencies that care for the disabled, mentally ill, and other exceptionally vulnerable groups, who depend on more than $3 billion annually from state funds. A straightforward tax of $1-$2 on each transaction in the financial services industry – particularly the futures exchanges, in which Chicago is the world leader – would raise from $10-$12 billion annually, solving all of Illinois’ and Chicago’s budget problems.